DVD rental software for Windows that provides all the features you need to run an entire rental store. It has databases for rental inventory and customers and tracks all current and late items. Reports offer daily summaries, overdue and multicopy analysis and print facilities include Photo ID cards and barcodes. For security each transaction is individually allocated to staff with secure log on. It requires no additional hardware but there are facilities for receipt printers, barcode readers and till drawers. The trial download is a compact Microsoft installer file about 1MB. It does not require registration or install any advertising components such as toolbars. Requires Windows XP or later. Great value for money with features normally only found on far more expensive software. Staff friendly, easy to use interface specifically designed to make operations straightforward. Single purchase payment price, no monthly or annual payments. Flexible rental duration settings and customer membership expiry options. Also suitable for tool hire, fancy dress rental and bike hire. Each user has to log on with all important operations logged so staff can be monitored. The menu items that are not to be available to standard users may be selected. The PIN rental facility can be used to prompt the customer for a code at the start of each rental. If a USB numeric keypad is added, the customer may alternatively be asked to tap the code in. A variety of takings, category, overdue and multiple copy reports are available. The F12 key pulls up an overview of the most useful information. An email report and log can be sent. The program supports wedge and USB barcode readers and will print both most commonly used Code 39 and EAN (UPC-A) barcodes on a variety of labels. The program will print membership cards with both photo ID and barcode. The program will accept input in most languages with it's unicode enabled database. Additionally the program has an option to customise virtually all the field and item names to facilitate international or custom use. The program can import the inventory or customer databases from a standard CSV (comma separated value, from Excel) text file. Instructions here. The program also offers a batch update facility (File menu, Update) from CSV file to simplfy any periodic requirement for change of stock. A variety of special offers are supported from blanket pricing and day returns to configurable overrides. A closed day option for automatically extending rentals is also available. The program permits both rental and monetary credit for each customer if required. There is also an expiry option with automatic indication. Non, one or two taxes may be specified with configurable descriptions. How much is the full version? $59.00 Includes CD and shipping. $74.00 Includes two manuals, media and shipping. What is the capacity of the full version? What is the difference between 4POSRENTAL and Winrental? 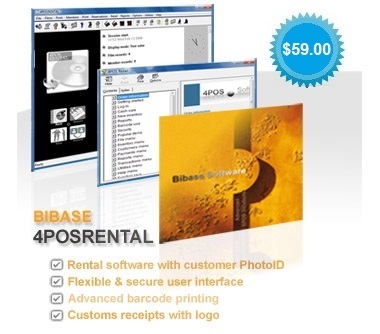 4POSRENTAL has an extended database that is Unicode enabled with additional information on customers and inventory to Winrental. It also has several addition facilities with enhanced reports and permits customers to rent up to 100 items. If I just buy the CD does it include the manuals? Yes, it includes the manuals in electronic form. No, the program may not be networked. The program does NOT require internet access. Do I need to activate the full version after installation? Yes, the full version of the program requires activation via a code that is emailed. We accept card or Paypal. The checkout page is secure operated by our credit card processor, Worldpay, owned by the Bank of Scotland. All prices include free worldwide shipping by Royal Mail.